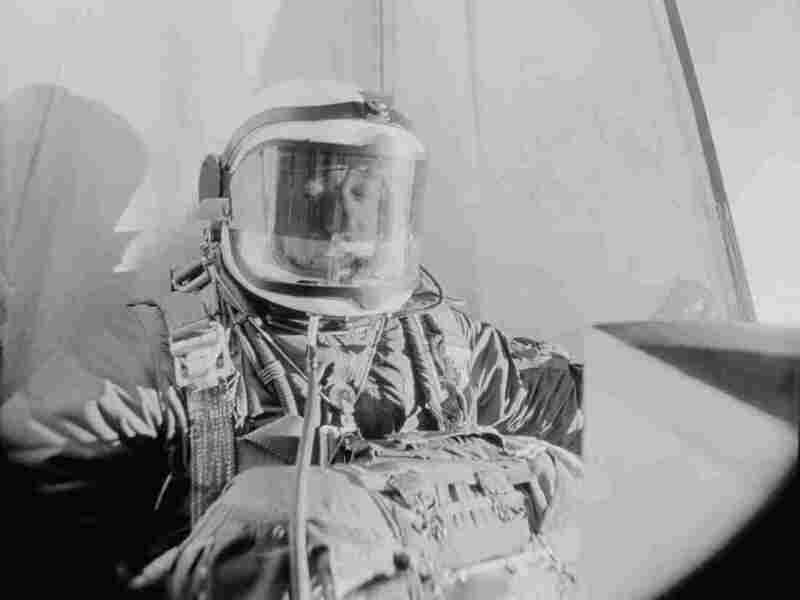 What It's Like To Freefall From 20 Miles Above The Earth Early Air Force experiments helped pave the way for the space program. Joseph Kittinger, who jumped from a balloon 103,000 feet up, talks about his experience. A camera in the gondola of his balloon photographs Air Force Captain Joseph M. Kittinger Jr., as he starts the jump that set his record-breaking parachute jump over southern New Mexico on Aug. 8, 1960. "I said, 'Lord, take care of me now.' And then I jumped," now-Colonel Kittinger tells NPR's Lourdes Garcia-Navarro. The PBS series American Experience tells the story of Kittinger and other participants in the early Air Force programs in the episode Space Men, which premieres March 1. Kittinger talked with NPR about what it's like to take such a plunge and what he thinks of the modern space program. It's a beautiful view because you can see 450 miles at that altitude. But then as you look aloft, about 10 or 15 degrees, the sky starts getting darker and darker as your eyes go up to 45 degrees or so. The sky's absolutely black. And it's daytime so it's a very unusual situation to be in that it's daytime and it's black overhead. First of all, you can't tell how fast you're going because there's nothing there to perceive, there's nothing that you can look at to determine your velocity. But you know you're going fast as you accelerate 32 feet per second per second. And after about 20 seconds I had reached terminal velocity, which in my case was about 614 miles an hour. But it took me 4 minutes and 36 seconds to freefall down to about 14,000 feet where I opened my main parachute. I was extremely busy. I was there as a test pilot and I was a very very busy person during that entire fall as I gathered data that we were there for. And the results were that when NASA started designing the Mercury project, we had already done a lot of the work that NASA would be facing. And we had answers to a lot of the questions that NASA had before they could design the Mercury program. I was delighted that I had had the opportunity to contribute to it. I had the option to volunteer for the program — I opted not to because I was very much involved in research that needed to be done. So I turned down the opportunity because I felt that what we were doing was valuable for the future of our space program. As a matter of fact the small 5-foot diameter parachute that we used to stabilize my freefall is still being used today in every ejection seat in the world. So what we did some 55 years ago is still being used today. I personally think that we should go back to the moon as soon as we can, because there's a lot of lessons we need to learn before we can go to Mars, which should be the next great human adventure.